Scitec BCAA Xpress is a dietary supplement that consists of three branched exogenous amino acids (BCAAs): leucine, isoleucine and valine. It helps to recover after an intensive training, works anti-catabolic and anabolic. The product is intended especially for people who give their best during the trainings. Thanks to a properly composed formula, the preparation has an excellent solubility, and at the same time it tastes delicious. BCAAs are three branched-chain amino acids - leucine, isoleucine and valine, which are crucial for our body to function efficiently, but the body itself is not able to synthesize them. It is therefore necessary to provide them from the outside, both with the protein food and through the supplementation. The supplementation has an advantage in the form of a very fast assimilation, so that taking BCAA immediately after the effort will not burden the stomach, and at the same time will trigger the regenerative processes. The ratio of the mentioned amino acids is 2: 1: 1, which according to numerous studies, is the most beneficial for our body. Leucine is the most important amino acid in this combination. It is the initiator and catalyst of the protein synthesis processes, also affects the synthesis of the growth hormone. What is more, it enhances the anabolic effect of insulin, so if it is present in a post-workout diet along with carbohydrates, it causes a very beneficial effect on a muscle mass. Ketoleucine, which is a leucine derivative, limits the effect of cortisol - a hormone that enhances the breakdown of muscle proteins. Isoleucine is responsible for accelerating the regenerative processes in the body after a hard physical exertion. Just as leucine is particularly appreciated by those who train the strength sports, isoleucine, that provides the additional energy reserves, is appreciated by people that prefer the endurance training. Isoleucine is often used as a support for the body after injuries or illnesses due to its regenerative properties. It also affects the blood sugar levels and contributes to the synthesis of hemoglobin. Valine helps in supplying muscles with glucose, so BCAA, when taken during a training, provides the energy and allows for much more intensive and longer exertion. Valine also influences the endurance in a different way. During the physical exertion, a large amount of tryptophan, the derivative of which is serotonin, is supplied to the brain. An increase in its level causes drowsiness and a decrease in the capacity of the body. Valine is treated by the brain as a substitute for tryptophan. Thus, less serotonin is created and the person who is exercising retains some energy reserve for longer. Valine also stabilizes the level of nitrogen that is important in the context of building the protein. Although the effort we make during a training is aimed at the muscle fatigue and damage to their structure, the key to the effects is the reversal of this condition, and therefore the fastest regeneration. Branched chain amino acids cause a rapid activation of the signaling pathways needed to rebuild damaged fibers. To put it simply, BCAAs tell the body which part should be supplied with nutrients as quickly as possible. By consuming BCAA after the training, we can also reduce unpleasant DOMS, which is a delayed onset muscle soreness. The use of branched chain amino acids after the strength training is intended to stop the muscle catabolism. Leucine, a substrate of HMB (3-hydroxy-3-methylbutyric acid) plays a significant role here, as it significantly inhibits the breakdown of proteins. Due to the acceleration of their synthesis, BCAA works strongly anabolically, and the stronger this effect is, the higher the desired increase in muscle mass is. Thanks to BCAA, our body builds the longed-for muscle mass much faster and more efficiently. Not without a significance is the fact that BCAAs constitute about 25-35% of amino acids in muscles. They are also metabolized there, which strongly determines their operation. As mentioned, BCAA helps in the effective building of the muscles that create an aesthetic, proportional figure. Higher muscle mass also means a higher energy requirement of the body - so with a large amount of muscle mass, when providing the same amount of food and exercising the same, we can burn much more calories and reduce fat faster than if we had less muscles. Numerous sources also state that BCAA maintains the leptin secretion at the optimal level. The amount of leptin decreases with a long-term caloric deficit, and which is necessary to reduce the body fat. 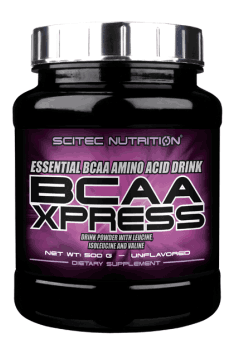 In summary, Scitec BCAA Xpress is a preparation that is a perfect supplement to any athlete who wants better and faster results. The optimal proportions of leucine, isoleucine and valine help in the fast recovery and building the muscle mass. BCAA is an excellent source of energy during the trainings, thanks to which they additionally gain in the length and intensity, which is of great importance for the figure and sports results. Dobre aminokwasy, górna półka jeżeli chodzi o jakość, regeneracja i samopoczucie ogólnie na plus. Cenowo wychodzi dosyć dobrze, sporo porcji. moim zdaniem produkt kompletny! stosuję od tygodnia i regeneracja jest niesamowita. rozpuszcza się idealnie 0 gródek smak bardzo dobry! gorąco polecam i daje mocną 5/5. jedne z lepszych bcaa jakie stosowałem! bardzo smaczne i ekonomiczne do tego! Use before going to bed. The suggested servings should be appropriate for the majority of users. Applying during training is a very good option when we perform long-lasting training sessions. In case of shorter sessions, using before and after training should be enough. *May have an adverse e ffect on activity and attention in children.